Of all the military bugle calls, none is so easily recognizable or more stirring and able to render emotion than Taps. Up until the Civil War, the traditional call at day's end was a tune borrowed from the French called Lights Out. Then, in the aftermath of the bloody Seven Days battles in July of 1862 and hard on the heels of losing 600 men and being wounded himself, Union General Daniel Adams Butterfield called the brigade bugler to his tent. He thought Lights Out was too formal and he wanted to honor his men with something different. "...showing me some notes on a staff written in pencil on the back of an envelope, (he) asked me to sound them on my bugle. I did this several times, playing the music as written. He changed it somewhat, lengthening some notes and shortening others, but retaining the melody as he first gave it to me. After getting it to his satisfaction, he directed me to sound that call for Taps thereafter in place of the regulation call. The music was beautiful on that still summer night and was heard far beyond the limits of our Brigade. The next day I was visited by several buglers from neighboring Brigades, asking for copies of the music which I gladly furnished. The call was gradually taken up through the Army of the Potomac." This more emotive and powerful Tap was soon adopted throughout the military. It was officially recognized by the U.S. Army in 1874, and it became standard at military funeral ceremonies in 1891. There's something singularly beautiful, mournful, and appropriate in the music of this wonderful call. Its strains are melancholy yet full of rest and peace. Its echoes linger in the heart long after its tones have ceased to vibrate in the air. Why Is It Called Taps? The origin of the word "taps" is thought to have come from the Dutch word for "tattoo," which is "taptoe." 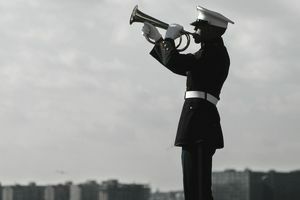 More than likely, "Taps" comes from the three drum taps that were played as a signal for "Extinguish Lights" when a bugle was not used in the rendition. As with many other customs, the 24 notes that comprise this solemn tradition began long ago and continues to this day. Perhaps unsurprisingly given the nature of the song's origin, there are no official lyrics for Taps. The following unofficial verse is often used. The author is not known.